The University of New Hampshire probably never gets ranked among America’s best flagship state universities. But what would you say about a flagship state university that has graduated over two-thirds of each freshman class that arrived between 2007 and 2014, and over 70 percent of the women in each class since 2006? For the class of 2022 the average GPA was 3.5. The middle 50 percent of the class scored between 1090 and 1280 on the SAT. The range for the ACT was between 23 and 38. To put these numbers into perspective, the average SAT score for the class at UMass-Amherst is a 1260 and the average GPA is a 3.9. The University of New Hampshire graduates students at the same rate as UMass-Amherst, which is more selective and more expensive for students who do not come from Massachusetts. If you prefer a campus-based community within an hour by train from a major city in the Northeast, there are five options: Rutgers-New Brunswick, the University of Delaware, the University of Maryland-College Park, SUNY-University at Buffalo and the University of New Hampshire. Among these schools, only the University of New Hampshire also houses more than half of its students on campus. With fewer than 13,000 undergraduates, the University of New Hampshire has a smaller undergraduate enrollment than popular private options such as Boston University and Syracuse as well as public options such as Delaware, Maryland, Rutgers, Penn State, UConn and Mass-Amherst. When you are visiting college campuses beauty is in the eye of the beholder. The University of New Hampshire campus follows a 19th century colonial motif, the major exceptions being the business school, dining hall and the hockey arena, all more modern designs. It’s very easy to walk anywhere, though the train station is a bit of a hike from the residence halls. Walk around this place and you feel that you are going to get as much from the school as you would from attending UConn or UVM. I believe that the University of New Hampshire has a more attractive campus than UMass-Amherst, but again, beauty is in the eye of the beholder. If Boston is the place where you want to be after college, the University of New Hampshire has nearly 55,000 alumni in and around the city. To lend perspective UConn has fewer than 14,000. The University of Vermont has fewer than 12,000. For those who are considering business school Poets and Quants does a more thorough ranking than anyone else. The Peter Paul School of Business and Economics at New Hampshire, while far from the most selective, ranked 48th for Career Outcomes, just behind Boston University and ahead of UMass-Amherst. It also ranked 35th for Alumni Satisfaction, ahead of Northeastern, Boston University and UMass-Amherst. But no college is perfect, including this one. In-state tuition and fees at the University of New Hampshire exceed $18,000 if you do not qualify for a scholarship, among the highest charges in the country. The non-resident charges exceed $35,000 which is also high. There are scholarships that make the school a better value for residents and non-residents, but you need a 3.2 to keep them. Because of the high base tuition and fees, the average student loan debt exceeded $33,000 for graduates in 2017. A quarter of the class took out private loans, high for a state university. The costs and weaker statistical profile might help to explain why the school loses 15 percent of a freshman class. UMass, UConn, Boston University and Northeastern University retain over 90 percent of their freshmen. 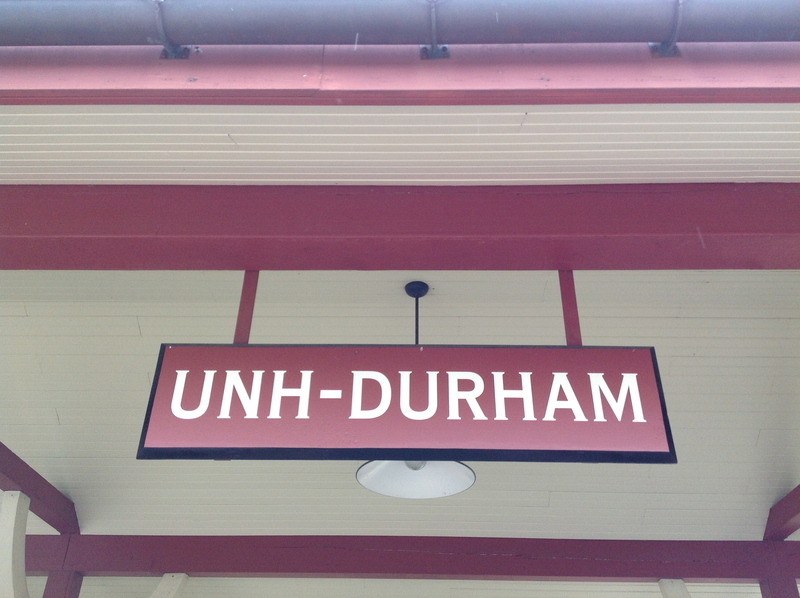 Downtown Durham could best be described as quaint, though it’s accessible from campus on foot. It does not have anywhere close to the dining, entertainment and shopping options that you might find in Amherst or Burlington. While a student who is mid-pack at UConn or UMass might get a scholarship to the University of New Hampshire, the honors program is no less selective. You still need at least a 3.9 GPA, close to 1400 on the SAT or an ACT score of 29 or higher. I also find the Commonwealth Honors College at UMass-Amherst to be more resourceful for its students. As I mentioned in my Distant Revisit to Miami University of Ohio, I prefer to measure a college by what it does for its students instead of rankings and selectivity. The University of New Hampshire achieves extraordinary results with a B+/SAT below 1200 student who might not get into UConn, UMass, BU or Northeastern and puts those students in a similar position to succeed. That’s what a very good state university should do. I only wish that the tuition and fees were lower.